(Carlo Sestieri, Rome); sold 1 August 1963 to Joseph McCrindle [1923-2008], New York; gift 2002 to NGA. Italian Baroque Paintings from New York Private Collections, The Art Museum, Princeton University, 1980, no. 46, repro., as St. Francis Praying before a Crucifix. In Celebration: Works of Art from the Collections of Princeton Alumni and Friends of The Art Museum, Princeton University, The Art Museum, Princeton University, 1997, no. 150, repro. Mortari, Luisa. Bernardo Strozzi. Rome, 1966: 168, fig. 7. Mortari, Luisa. 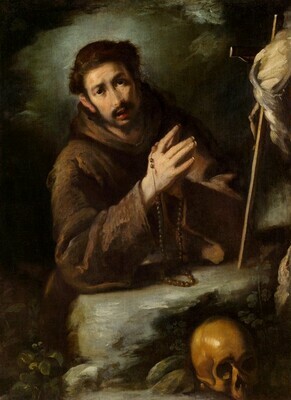 Bernardo Strozzi. Rome, 1995: no. 33. Grasselli, Margaret M., and Arthur K. Wheelock, Jr., eds. The McCrindle Gift: A Distinguished Collection of Drawings and Watercolors. Exh. cat. National Gallery of Art. Washington, 2012: 10, fig. 13, 19, repro. 185.